UNC-R is the world’s first Nano Coating that turns into a Rubber Membrane when cured in room temperature. This flexible nature enables the finish to be ultra-resistant to wash swirl mark build-up* and does not suffer from hard water spotting like some Nano Glass Coatings do. Incredibly glossy, super smooth and easy to clean surface is what UNC-R is all about! Same as our Nano Glass Coatings, UNC-R is a permanent coating and can only be removed with sand paper once fully cured. Has extremely high chemical resistance (Salt, Acid, Brake Dust, Exhaust Gasses, Tree-Sap, etc.) and high UV filtering properties. Recommended to apply at temperatures below +20c, with perfect application temperatures from +5c to +15c. 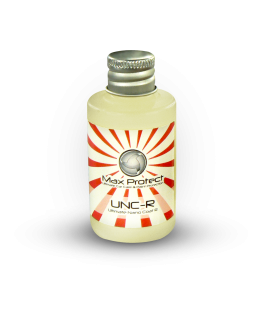 If you live in a hot country, please see UNC v1 or UNC v2 as an alternative, or if you are after the ultimate car paint protection, apply UNC-R in smaller patches to avoid smearing in +20c and above temperatures.